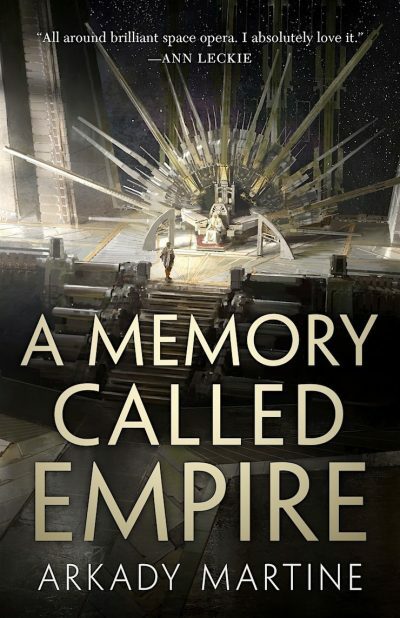 A Memory Called Empire is Arkady Martine’s debut novel. It is a space opera. Lsel Station has spent ages engaged in a careful dance with the Teixcalaanli Empire. It tries to maintain vital trade ties to the vast polity, but avoids becoming so essential as to invite annexation. The empire is a dangerous neighbour, but it protects Lsel from neighboring polities who are even worse. Hence the dance. Mahit Dzmare is the latest ambassador to be dispatched by the Stationers to the empire. If she plays her cards badly, she may be the final ambassador to the empire. Unbeknownst to the empire, Lsel’s adaptions to its peculiar circumstances — low population, living in an artificial environment habitable only because Lsel takes care to ensure skills and experience are passed on — include imagos, mental recordings that provide their hosts with access to the knowledge of those who held such positions in the past. Mahit heads to the empire armed with her predecessor Aghavn’s recorded mind. The capital of the empire is the vast megalopolis imaginatively called City. After all, the empire is all, and the City is its finest accomplishment; no need to specify which city people mean when they say City. It is home to a myriad of bureaucracies, all operating under the benevolent gaze of the Light-Emitting Starlike Emperor. From the outside, the empire appears to be a stable monolith. Once in the City, Mahit discovers that this is not true at all. The empire is riddled with factions, all with an eye on the main chance. Each bureaucracy attempts to expand its remit and downgrade its rivals. The masses are not at all content to conform and obey. There are mass protests; revolutionaries set off bombs. The emperor is old and it’s unclear who will follow him. Civil war is likely. Mahit also discovers that Aghavn must be replaced because he is dead, that Aghavn is dead because he was murdered, and that Aghavn was somehow intimately entangled in imperial affairs. Whatever Aghavn was doing, his actions placed Lsel Station firmly in the crosshairs of the Empire. Living with a vast empire led by a succession of variably competent heads of state, an empire that is simultaneously an invaluable trading partner and an existential threat, feels very familiar for some reason. Some real world situation no doubt, but I’m not sure which one. Ah, well. Whatever it is cannot have any implications for me personally. For an empire that rules many systems, the court seems oddly cozy. It’s like a small town where one often stumbles into senior functionaries1. Perhaps this is because Aghavn had spent decades insinuating himself into the heart of the empire; his successor will be of great interest to the various factions. If this hadn’t been the case, perhaps Mahit would have spent most of her time in outer vestibules dealing with minor bureaucrats. That’s my guess … or you can call it a retcon. This book reminds of C. J. Cherryh novels in which characters with insufficient information and suffering from sleep deprivation are cast into situations where they cannot be sure what is true, what is happening, or who their true allies are. If indeed they have any allies. Plots: a high stakes game with the protagonist’s life and (as in this case) the survival of their group at stake. Fun stuff! For the reader, if not for poor Mahit. This books doesn’t read like a debut novel; it seems the polished work of a pro. Although this is clearly intended as the first in a series, A Memory Called Empire functions as a standalone adventure. I recommend it. A Memory Called Empire is available here (Amazon), here (Amazon.ca) and here (Chapters-Indigo). 1: I once stumbled (physically stumbled) into then Prime Minister Paul Martin. His bodyguards frowned at me rather than cutting me down in a hail of gunfire. Oh Canada! Huh. I wonder if that was deliberate?